Audi assembles the TT roadster (shown) TT coupe, and two other models in Gyor. Audi will add 2,100 jobs at its unit in Hungary, 300 more than initially planned, as the carmaker expands production, Audi said today. The Volkswagen AG luxury brand, which set up its Hungarian unit in 1993, currently employs more than 6,500 people at its subsidiary in the western Hungarian city of Gyor, Audi said in a statement. 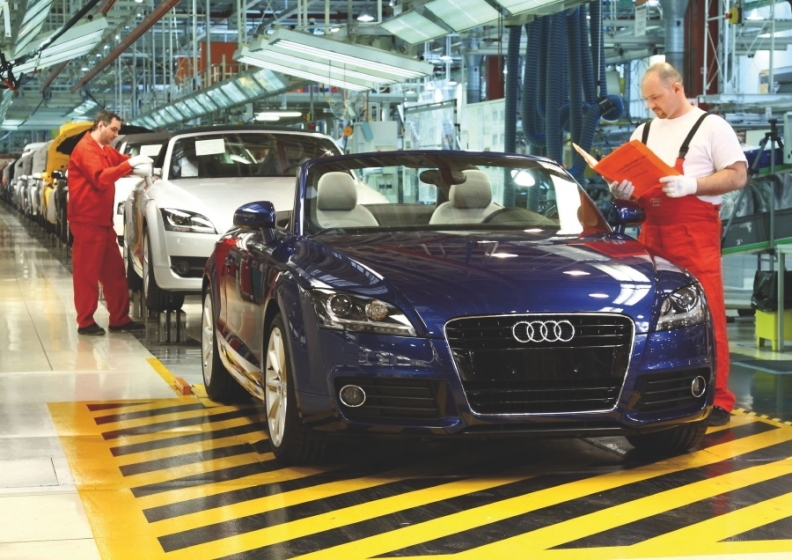 Audi announced in September it would invest 900 million euros ($1.3 billion) in Hungary by 2013, creating 1,800 jobs. As part of the expansion, Audi will add a press shop, body shop, paint shop and new assembly line in Hungary. Currently it has an engine plant and vehicle assembly line in Gyor, which makes the TT coupe, TT roadster, A3 cabriolet and RS3 sportback. Another A3 derivative will be added in Hungary, taking production to 125,000 cars a year by 2013, Audi said. "This decision adds the final link to the production chain at this location, and we will now be able to handle every stage in the building of an Audi model here, from sheet metal to finished car," Audi CEO Rupert Stadler said in a statement. "This investment means we are stepping up our international competitiveness." Hungary will extend 11.2 billion forint ($61 million) in state subsidies to Audi, Economy Minister Gyorgy Matolcsy said in April.